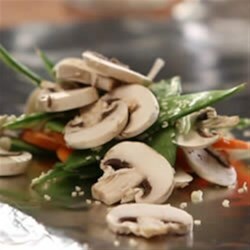 "Carrots, snow peas, mushrooms and scallions with fresh ginger and sesame seeds are drizzled with a sweet and sour sauce, wrapped in foil packets, and baked until veggies are just tender." Preheat oven to 450 degrees F. Mix melted butter, soy sauce, rice vinegar and brown sugar in a small bowl; set aside. Mix remaining ingredients in a large bowl. Place half the veggie mix in center of sheet of foil. Spoon half the butter mixture over veggies. Bring up sides of Reynolds Wrap(R) Heavy Duty Aluminum Foil over veggies; fold down two times. Double fold both ends of foil to seal packet, leaving room for heat circulation inside. Repeat to make second packet. Place packets on baking sheet with 1-inch sides. Bake 15 to 20 minutes or until veggies are desired crispness. Open packets carefully by cutting along top folds with a sharp knife, allowing steam to escape. Stir to coat evenly. One of the benefits of cooking with Reynolds Wrap® Heavy Duty Aluminum Foil is customizing each packet. Best of all, you can write on the foil to keep track of each one. Not yet but on my next trip to Vons's I will pick up these items. Can't wait to try out this recipe. Easy and delicious. Made it per the recipe. This will become a regular in our family.